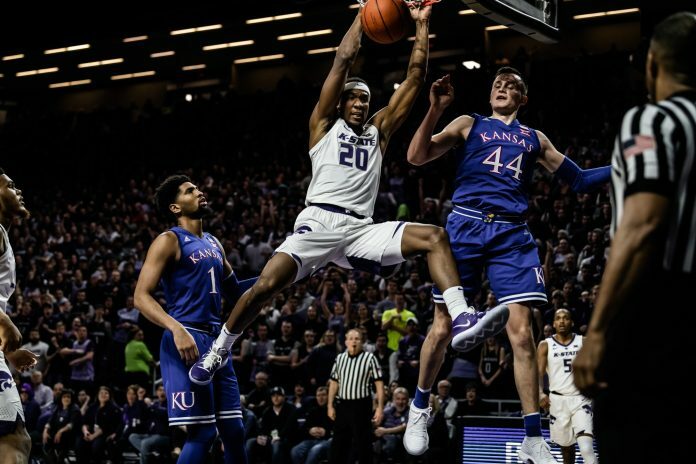 The Kansas State men’s basketball team came out of the locker room on fire against in-state rival Kansas — twice — on Tuesday night in Bramlage Coliseum. They cooled off quickly in both halves, but ultimately held on for a 74-67 win. Senior guard Kamau Stokes had the game’s first five points. He knocked down a 3-pointer on the Wildcats’ first possession, and just 21 seconds later, he stole the ball back and laid it in on the other end. 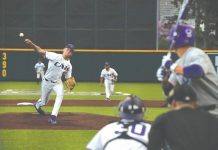 “In the games we’ve started off well, we’ve pretty much done well the whole game,” Stokes said. The Wildcats would ultimately force 23 turnovers in the game, while only committing 12 themselves. After building to an 8-1 lead early in the first half, junior forward Makol Mawien picked up his second foul in just two minutes of play. He did not return in the first half. When the Jayhawks were down 14-6, they switched to a 2-3 zone defense and put the clamps on the Wildcats’ offense. K-State suffered an eight-minute stretch without a field goal and trailed 33-27 before sophomore guard Mike McGuirl knocked down a 3-pointer with just under a minute left in the first half. The Wildcats went into the halftime locker room down 33-30. They were shooting 39 percent from the field, with the same percentage from the 3-point line. Their free throw percentage was an abysmal 25 percent. “In the second half, my teammates just wanted me to be aggressive,” senior forward Dean Wade said. The Wildcats bounced back out to a 44-38 lead on the back of a 5-0 run just six minutes into the second half. KU looked poised to make a comeback for the next several minutes, but a 3-pointer from junior forward Xavier Sneed and another from sophomore guard Cartier Diarra kept K-State up 50-44 with 11 minutes left in the second half. Coming out of the under 12-minute timeout, KU switched out of its zone to a man-to-man defense, and K-State went cold again from the floor. With seven minutes to play, a rebound trickled out of Mawien’s hands and ended up in the hands of KU’s junior forward Dedric Lawson, who put it home to make it 53-52, with K-State leading by a single point. With five minutes to play in the game, KU’s foul trouble came to bear. K-State found itself in the double-bonus and KU’s freshman guards Quentin Grimes and Devon Dotson had four fouls. Better free throws from the Wildcats would have sealed the game at that point, but K-State only shot 58 percent from the line. KU had another run in them, though. They pulled to within three points with just over one minute to play, but Sneed hit a corner 3-pointer to pull ahead 67-61. Diarra had a windmill dunk to put a nail in KU’s coffin, and then Brown finished the game with a dunk of his own. Unfortunately, Brown’s dunk was just a millisecond too late to count for points. Brown lead K-State with 18 points and five assists. He was one of four Wildcats who scored double digits along with Sneed, Wade and Diarra. “It was a bucket list game for us,” Brown said. K-State’s next basketball action will be against Baylor in Waco, Texas, on Saturday at 5 p.m. It will be televised on ESPN2.